After six years of doing this FloatingSheep thing and something like 400 different posts, we finally decided to summarize a bit of our research in our newly published essay/manifesto, entitled "What Would a Floating Sheep Map?". A collaboration between the five members of the FloatingSheep collective and Rich Donohue and Matt Wilson of the University of Kentucky, our manifesto tries to provide some context to the broader debates about mapping that we've been participating in for the last several years. Our manifesto is about maps, but it's not just about maps. We like maps and celebrate high-quality, aesthetically-pleasing, intellectually engaging and (yes) amusing maps. Our aim, however, is to do much more than express an appreciation for maps. We also want to challenge people to think deeply about space, construct maps that demonstrate an awareness of social contexts, and critique these very same maps. Thus, our manifesto focuses not on the specific techniques or technologies of map-making, but on the societies, spaces, and places that are being mapped, and from which maps emerge. While we'll leave you to actually read the entire thing, as a bit of a teaser, here are the six key points that summarize our manifesto, and, ultimately, the last six years of FloatingSheep research that we've shared with you here on the blog. #1a. Maps help us to understand the world. #1b. But maps also produce the world as we know it. #2b. But lies are the source of maps' power. #3a. Maps are now fundamentally different. #3b. But maps are still fundamentally the same. #4a. Pretty maps are better than ugly maps. #4b. But ugly maps will do in a pinch. #5a. Map or be mapped. #5b. But not everything can (or should) be mapped. #6a. Maps of the digital world are a reflection of the material world. #6b. But this reflection is imperfect and distorted. Zook, Matthew, Taylor Shelton, Ate Poorthuis, Rich Donohue, Matthew Wilson, Mark Graham, and Monica Stephens. What Would a Floating Sheep Map? Lexington, KY: Oves Natantes Press, 2015. http://manifesto.floatingsheep.org. Have you ever wondered what it is like to take a classes at one of home institutions of Floating Sheep? In this case, the Department of Geography at the University of Kentucky, a place where the land flows with milk, honey and cutting-edge insight with giant herds of critical GIS researchers roaming the tundra and bellowing out challenges? But it is a place where we have stock-piled Floating Sheep stickers and tattoos for the coming apocalypse. And sometimes these artifacts emerge and are reused and parodied by the denizens of the department. Ergo , the following cartoon  has appeared in Kentucky, the work of the talented Emily Kaufman, Ph.D. student. 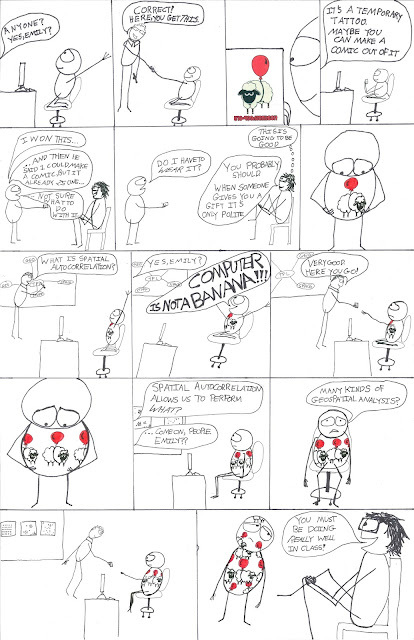 And while the Floating Sheep collective would love to have come up with the "Computer is not a banana" as a metaphoric/allegoric/crazed bon mot -- if for no reason beyond its mysterious incomprehensibility -- we cannot take credit. This is the idea of Jeremy Crampton, who is actually the professorial figure featured in the cartoon. And no, we don't under why a "computer is not a banana"  either. What a great word, love to use that word. Technically a mixed media collage of paper, ink and tattoo. We are in cautiously in agreement with this statement although we think the idea of a banana-based computer is great idea. It has recently been revealed that David Cameron, the Prime Minister of the United Kingdom, has potentially engaged in sexual acts with the head of a pig. Yes, really . We assume the technical term would be beastialnecrophiliality. Or Necrophilibeastialogy. Or Ick! 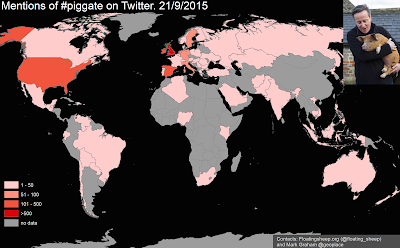 Because of our deep commitments to both data science and animal welfare here at Floatingsheep, we decided that we needed a better understanding of how the conversation around #piggate is spreading geographically. Also, how we can resist such a wonderful story about a "debauched and secretive society" at one of the home institutions of FloatingSheep. Hint: it is NOT the University of Kentucky. In the map above, you can see that people in the UK - for obvious reasons - are most likely to be tweeting about the Prime Minister and his, erm, attachment to pigs . The French, interestingly, seem to be largely ignoring the story. Whereas the Spanish, Irish, and Americans all seem to be highly tuned-in (perhaps because of the love of bacon and ham in all three countries). The spatial dynamics of #piggate will, of course, evolve over the next few hours and days; but until then, this is perhaps the obvious next addition to any conversation that begins with 'where were you during #piggate 2015.' What a time to be alive! Unless of course you happen to be the severed head of porcine. Yes, that is actually the accusation. We're still have trouble processing the news as well. Perhaps rapprochement is better term. After all it's a French word and makes it sound somehow better. And frankly this needs all the help it can get. The Oxford Internet Institute is a leading centre for research into individual, collective and institutional behaviour on the Internet. We are looking for a full-time Researcher to work with Professor Mark Graham on the ERC-funded project Geonet: Investigating the Changing Connectivities and Potentials of Sub-Saharan Africa's Knowledge Economy. Combining archival research, surveys, and in-depth interviews, this ambitious project will critically assess the changing landscape of digital work in Sub-Saharan Africa, and ask who benefits (and who doesn’t) from those changes. In this exciting role, the Researcher will carry out 9-12 months of fieldwork among digital workers and organizations in Sub-Saharan Africa, as well as working at OII’s premises in Oxford. The Researcher will also contribute to the dissemination of the findings through peer-reviewed academic papers, project reports, events, blogs and social media. Candidates should have experience of social science research in Development Studies, Geography, Sociology, Social Anthropology, Communications, Organization Studies, Management or related disciplines, training and practical experience in qualitative research methods. Based primarily at the Oxford Internet Institute (with periods of fieldwork), this position is available immediately for 3 years in the first instance, with the possibility of renewal thereafter, funding permitting. For qualified candidates, there may also be opportunities to teach course modules on our ‘Social Science of the Internet’ MSc course. The application form and further details, including a job description and selection criteria, are available on Oxford University's recruitment website. The closing date for applications is 12:00 BST on Thursday 3 September 2015 and only applications received before then can be considered. Interviews for those short-listed are currently planned to take place in the week commencing Monday 21 September 2015. We love mapping beer, there's no secret about that. We've been making maps about the digital landscapes of beer across the world practically since we started this blog six years ago, and this work is consistently some of our most popular. This includes some maps on the geographies of beer-related tweeting in the United States, building from a book chapter by Matt and Ate. Now we want you to join in the fun of exploring this liquid landscape. 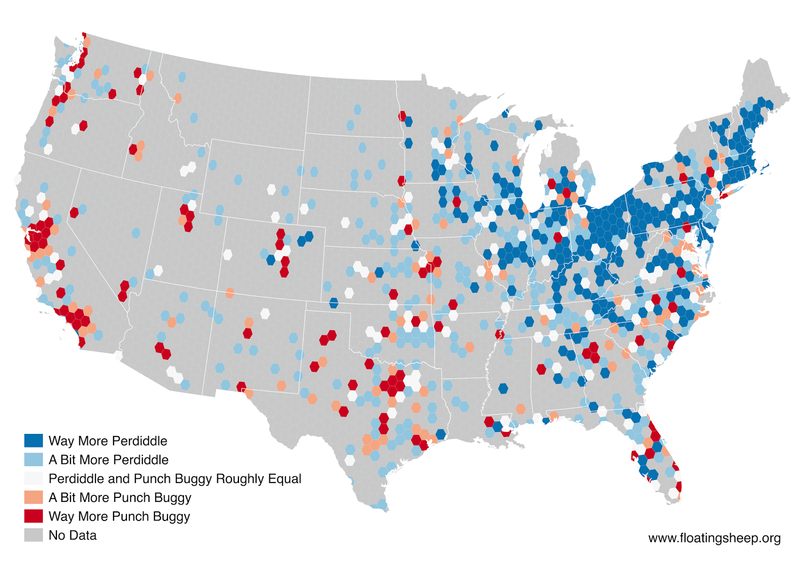 To celebrate the rollout of a new online graduate program in digital mapping (New Maps Plus at the University of Kentucky) we offer up this interactive visualization of America's beer-related tweeting. Choose a type or brand of beer and see where people tweet about it or compare the attention to two different kinds of beer. Special thanks to Rich Donohue who built this slick interactive user interface with the Leaflet library. If you're curious about how this map was built and designed (or are interested in doing something like this yourself) check out the New Maps Plus program. More saturated (darker) colors indicate a higher probability of tweets containing a textual reference to the selected beer type. You can visually explore a variety of beers by selecting a new beer from the drop-down menu at the top right. By default, a given beer is normalized by a random sample of the overall Twitter population, though you can also compare two different beers by selecting another beer from the second drop-down menu. Hexagons without a significant number of observations/tweets do not show up. That's why some beers have more coverage than others. Feel free to start playing right away, but in order to whet your appetite, here are some examples what you'll find. Starting with arguably the most locally-specific beer on our list, one can clearly see how Grain Belt beer is thoroughly grounded in the culture of the upper midwest, especially in Minnesota, and to a lesser degree Iowa and Wisconsin. It's interesting to note, however, that despite this very particular concentration, Grain Belt barely cracks the top 10 list for absolute beer references throughout the area. This obviously raises the important issue of recognizing that (nearly) all Grain Belt drinkers are Minnesotans, but not all Minnesotans are Grain Belt drinkers! We must admit we've not had the pleasure of trying Grain Belt ourselves, and we're not quite sure if that is a good thing or a bad thing. Although the Boston Brewing Company will be quick to tell you that it is still a craft brewery, Sam Adams is remarkably more diffuse throughout the US. However, one can also see that Sam Adams' home is very clearly in Massachusetts and extending into Maine, New Hampshire and Vermont, though the beer remains less talked about in these locations than a number of other non-local varieties. Tweeting about Yuengling, however, represents a few interesting deviations from the patterns seen with Grain Belt and Sam Adams. For one, Yuengling has a much more prominent role within the Pennsylvania area, asserting itself as a top-5 beer-of-choice throughout the state, and even coming in as the #1 beer referenced in the area around Bethlehem, PA, not far from the Yuengling brewery in Pottsville. Second, while Yuengling is similar to Sam Adams in its wider distribution throughout the US, the number of references to the beer drop off significantly to the west of the Alleghenies, and are practically non-existent to the west of the Mississippi River. Finally it's interesting to note that Yuengling also represents the unique case of a regionally-specific beer that is actually multi-polar, as the beer is also prominent in Florida due to its secondary brewery being located in Tampa. A reverse of this spatial distribution can be seen in the case of Shiner Bock, whose references are dominant in much of Texas, especially around the Spoetzl Brewery in Shiner. Though concentrations extend beyond the Lone Star state into Louisiana, Arkansas, Oklahoma and Kansas, don't even try to get midwestern or New England states on board with this Texas brew. There's nothing like the simulated authenticity of drinking a cerveza when trying to cool down on a hot day. But, as a comparison of Corona and Dos Equis shows, which Mexican beer you choose is likely (at least a bit of) a function of where you are. While Corona tends to be more concentrated in California, Florida and parts of the northeast, Dos Equis tends to be concentrated in the middle part of the country, especially centered on Texas. Last but not least, we thought it important to take a closer look at the geography of the country's two most popular beers, Bud Light and Coors Light. And while Bud Light sales were well over double those of Coors Light in 2014, tweeting activity around these two popular watery substances (sorry, we're solidly in the craft beer camp) reveals some interesting caveats to this seemingly one-sided competition. Indeed, just to the west of the Mississippi River appears a fairly clear dividing line at which the bevy of Bud Light in the eastern United States gives way to a western preference for Coors Light. And while the eastern seaboard between New Jersey and Rhode Island seems to be the one eastern outpost of Coors Light, Bud Light actually remains the most popular beer being tweeted about in these areas. But because the statistical comparison looks not at absolute numbers, but the prevalence compared to the expectation at the national-level, the seeming competition here is a bit deceiving. Indeed, references to "Coors Light" itself are incredibly sparse throughout the US, and the term rarely cracks the top 10 for any given locale, although the more generalized "Coors" in these areas makes clear the regional preference. Whew! That was a lot of work. We're off to kick-back and enjoy a cold one. Have fun with the map and be sure to tell us which beers we didn't include...We suspect there will be many future iterations! If you want to learn how to make maps like this, check out the new online graduate certificate and master's degree in digital mapping from New Maps Plus! The first batch of classes start October 4! Later tonight, the beloved Wildcats of the University of Kentucky men’s basketball team face the University of Wisconsin Badgers in the Final Four. And while the score will ultimately be settled on the court, this (sort of) rivalry can’t help but spread to other arenas. You’ve got the greatest tradition of cheese-making and beer brewing in the United States up against the greatest tradition of burning couches, making (and drinking!) bourbon and betting on horses. You’ve got those former Wisconsin-ites of Maptime Boston starting stuff with the good hearted Kentucky folks at MaptimeLEX. You’ve got new maps versus old maps. Indeed, the map itself offers an important terrain on which to fight the battle between Kentucky and Wisconsin. The unsourced map below represents just the first cartographic shot fired in this war. While Wisconsinites might like to think that only their Minnesotan rivals to the west are the only ones that would side with Kentucky in this match-up, how are we to believe such cartographic assertions without interrogating the context of the map? From what dataset is this map constructed? Why is this data aggregated to the state level, anyways? Why isn’t Canada similarly disaggregated into province-level data? Are we really to assume that such administrative regions are internally coherent in terms of their sports-rooting interests? I mean, UK even has a half-Canadian player! Even if we are assuming that, why are we assuming that Mexico doesn’t like college basketball, too? Similarly, why are there no gradations to reflect those places that might be relatively conflicted about who they’re rooting for? Why is there no context regarding the motivations behind such rooting interests (e.g., Michigan State and Duke fans who would much rather play Wisconsin than Kentucky in the championship game)? Quite obviously, we can’t trust this map. 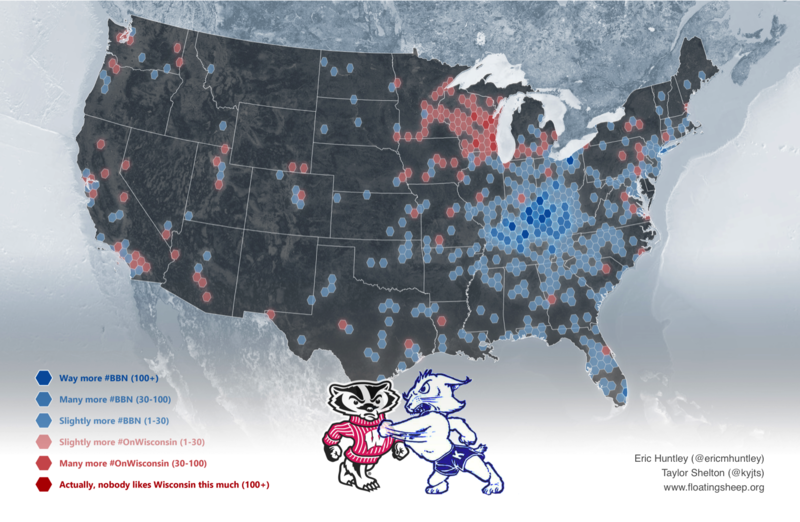 Maps are fallible and power-laden and subject to the whims of the always-partial cartographer, in this case some Wisconsin fan who needed to make themselves feel good before a second-straight Final Four defeat at the hands of the greatest program in the history of college basketball. What we can trust, however, is that always transparent window into the collective social psyche of 21st century America: our database of geotagged tweets. This kind of data is objective and apolitical, a true representation of the world as it actually is. So, collecting nearly a month’s worth of tweets in the continental US from March 1 thru March 30 for the more-or-less official school hashtags of #BBN and #OnWisconsin, we sought to create a more objective, data-driven representation of the geography of Saturday’s matchup, as seen below. At the broadest level, #BBN tweets outnumber #OnWisconsin tweets by over 5x: 5,707 to 1,039. For a state that’s only about three-quarters as populated and a university that has only about two-thirds as many students, I’d say that’s a resounding victory for the Big Blue Nation. While each team dominates its own state (though we should note, there are some parts of Wisconsin without any pro-Wisconsin tweets at all! ), those areas with more #BBN tweets than #OnWisconsin tweets are a bit more numerous throughout the country. Importantly, Kentucky fans have taken over key outposts such as Chicago and New York City, along with Nashville (the site of this year’s Southeastern Conference tournament), Cleveland (the site of the Midwest Regional) and Indianapolis, the site of the Final Four itself, not to mention much of the south, more generally. These are important strategic victories in the geography of basketball fandom this week, as the only other state Wisconsin fans have dominated apart from their own is Minnesota, in clear contrast to the stylized representation seen up above. Indeed, it’s quite telling that based on our hexagonal aggregation, no place in the United States has more than 100 more #OnWisconsin tweets than #BBN tweets: not even Madison, Wisconsin! Many thanks go out to Eric Huntley, PhD student in the Department of Geography at the University of Kentucky, for his help with this map! No hard feelings, Wisconsin fans. We love y'all. But seriously, GO CAYTS! And may we have another occasion to publish an academic paper about UK fans celebrating a national championship!